Chronic non-healing wounds affect millions of patients each year and contribute significantly to their morbidity and mortality. These wounds have a substantial impact because of their economic burden and the significant effect on the reduction in quality of life, as well as the increased risk of death for those patients affected by them.1 A 2014 study of Medicare data showed that chronic non-healing wounds and associated complications affect nearly 15% or 8.2 million Medicare beneficiaries. The study also estimated the cost to treat these wounds at between $28.1 billion and $31.7 billion annually.2 The highest costs were associated with infected or reopened surgical wounds, and outpatient care had the highest site-of-service costs. In addition to being older, most of these patients have obesity and diabetes. Underlying causes often include diabetic foot ulcers, venous leg ulcers, arterial insufficiency, and pressure ulcers. The list of complications contributing not only to chronicity but also to further deterioration is quite lengthy. The prevalence of chronic wounds and their complications has not been well documented in the literature. However underappreciated they may be, the complications associated with chronic wounds increase the cost—both financial and personal—to the individuals with these wounds.3 Although not an all-inclusive list, some of the more common complications include infection, tissue necrosis and gangrene, periwound dermatitis, periwound edema, osteomyelitis, hematomas, and dehiscence.4Our purpose is to discuss the presentation of each and potential interventions. The most common cause of delayed healing in chronic wounds is infection. Microbial contamination of wounds can progress to colonization, to localized infection, through to systemic infection, sepsis, multi-organ dysfunction, and subsequent life- and limb-threatening infection. The actual determination of infection can be complicated by the presence of biofilms, not on the surface but deep in wound tissue.5 Biofilm presence also contributes extensively to keeping the wound in a state of prolonged inflammation by the stimulation of nitric oxide, inflammatory cytokines, and free radicals.3 As a result, one of the best ways to get the wound back on track is effective wound bed preparation beginning with debridement and use of topical antimicrobials. It is important to bear in mind the problem of increased microbial resistance to antibiotics, so using antiseptics, which are less likely to result in resistance, may be a more effective choice. Infection in chronic wounds can spread to surrounding tissues and to underlying bone. In patients with diabetes-related foot ulcers, infection is among the most common reasons for hospitalization. Of those patients with diabetic foot ulcers, 20% to 60% will develop osteomyelitis, thus increasing the risk of lower extremity amputation.6 Before the availability of antibiotic therapy, the only recourse was surgical intervention either for debridement of necrotic tissue and bone or, unfortunately in many cases, for amputation. Many times amputation was chosen as the intervention because of the surgeon’s fear that the infection would spread up the limb. The arrival of antibiotic therapy brought about a drastic reduction in amputations and mortality. Until as little as two decades ago, antibiotic therapy was used primarily as an addition to surgical bone resection. More recently, however, the effectiveness of antibiotic therapy has shown that in some cases osteomyelitis may be cured without surgical resection. 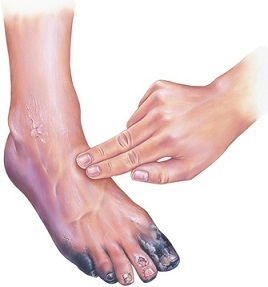 There are many schools of thought on the subject and potential advantages and disadvantages of primarily surgical or primarily medical and antibiotic therapy.6 For surgical intervention the advantages include removal of necrotic bone, bacteria, biofilm, and bony prominences, and it provides an opportunity to stabilize the foot anatomy. Disadvantages include increased risks of reulceration, operative morbidity, transfer ulcers, and destabilization of foot anatomy, along with the fact that surgery is expensive. The advantages of medical intervention and antibiotic therapy include avoidance of surgery, possible avoidance of hospitalization—or at least shortening of hospital stay—and decreased rate of amputation. Disadvantages include increased risks of recurring infection, reulceration, and development of antibiotic resistance or antibiotic toxicities and an increased risk of Clostridium difficile. How much do you know about chronic wound assessment and management? Take our 10-question quiz to find out! Click here. Improved perioperative care and surgical techniques, along with advanced wound therapy technologies, have made achieving primary closure of surgical incisions, flaps, and grafts easier. Also, the effective management of surgical incisions, donor sites, flaps, and grafts is important to prevent potential complications such as surgical-site infections and wound dehiscence. Many times, however, underlying comorbidities combined with surgical-related factors make management of surgical incisions and primary closure challenging because of the high risk of complications.14 A study by Abe and colleagues15 looked at 52 patients who had undergone flap and graft surgery. The non-healing group’s wounds were at the donor site, which had not healed in over 3 weeks post-operatively, and the healing groups wounds had healed within 3 weeks post-operatively. Of the 24 patients showing delayed healing, six required additional surgical intervention. Risk factors associated with dehiscence were high body mass index, smoking, and skin grafting. As for the 37 patients who underwent skin grafting, 23 experienced delayed healing at the donor site. Chronic non-healing wounds are costly both financially and physically for millions of patients every year. Early identification of risk factors and potential complications can mean the difference in whether a positive outcome is achieved or not. Using both the knowledge and resources available is the starting point for early detection and management of these risks. Then, should complications arise, using professional expertise and the technology our health care industry provides will enable us to mitigate risk and achieve optimal clinical and financial outcomes. 1. Jarbrink K, Ni G, Sonnergren H, et al. The humanistic and economic burden of chronic wounds: a protocol for a systematic review. Syst Rev. 2017;6(15):1–7. doi: 10.1186/s13643-016-0400-8. Available at: https://www.ncbi.nlm.nih.gov/pmc/articles/PMC5259833/. Accessed March 13, 2018. 2. Nusgart M. Alliance of Wound Care Stakeholders update: demonstrating the impact and cost of chronic wounds. Ostomy Wound Manage. 2017;63(10):1943–2720. Available at: http://www.o-wm.com/article/special-owm-alliance-wound-care-stakeholders.... Accessed March 13, 2018. 3. Jarbrink K, Ni G, Sonnergren H, et al. Prevalence and incidence of chronic wounds and related complications: a protocol for a systematic review. Syst Rev. 2016;5(1):152. doi: 10.1186/s13643-016-0329-y. Available at: https://www.ncbi.nlm.nih.gov/pmc/articles/PMC5017042/. Accessed March 13, 2018. 4. Gould L, Abadir P, Brem H, et al. Chronic wound repair and healing in older adults: current status and future research. Wound Repair Regen. 2015;23(1):1–13. doi: 10.1111/wrr.12245. Available at: https://www.ncbi.nlm.nih.gov/pmc/articles/PMC4414710/. Accessed March 13, 2018. 5. Leaper D, Assadian O, Edmiston CE. Approach to chronic wound infections. Br J Dermatol. 2015;173(2):351–8. doi: 10.1111/bjd.13677. Available at: https://www.ncbi.nlm.nih.gov/pubmed/25772951. Accessed March 13, 2018. 6. Lipsky BA. Treating diabetic foot osteomyelitis primarily with surgery or antibiotics: have we answered the question? Diabetes Care. 2014;37(3):593–5. doi: 10.2337/dc13-2510. Available at: http://care.diabetesjournals.org/content/37/3/593.long. Accessed March 13, 2018. 7. Mani R, Margolis DJ, Shukla V. Optimizing technology use for chronic lower-extremity wound healing: a consensus document. Int J Low Extrem Wounds. 2016;15(2): 102–19. Available at: http://journals.sagepub.com/toc/ijla/15/2. Accessed March 13, 2018. 8. Sandu CD, Constanin C, Raducu L, Moraru O, Visan SA. Management of necrotic lesions in chronic limb ischemia. J Surg Sci. 2015;2(1):34–7. Available at: https://www.researchgate.net/publication/285390472_Management_of_Necroti... Accessed March 13, 2018. 9. Campbell JL, Coyer GM, Osborne SR. The skin safety model: reconceptualizing skin vulnerability in older patients. J Nurs Scholarsh. 2015;48(1):14–22. doi: 10.1111/jnu.12176. Available at: http://onlinelibrary.wiley.com/doi/10.1111/jnu.12176/full. Accessed March 13, 2018. 10. Advanced Tissue. Severe edema: a detriment to wound healing. 2018. Available at: https://www.advancedtissue.com/severe-edema-a-detriment-to-wound-healing/. Accessed March 13, 2018. 11. Frykberg RG, Banks J. Challenges in the treatment of chronic wounds. Adv Wound Care. 2015;4(9):560–82. doi: 10.1089/wound.2015.0635. Available at: https://www.ncbi.nlm.nih.gov/pmc/articles/PMC4528992/. Accessed March 13, 2018. 12. Kruse CR, Nuutila K, Lee CCY, et al. The external microenvironment of healing skin wounds. Wound Repair Regen. 2015;23(4):456–64. Available at: http://onlinelibrary.wiley.com/doi/10.1111/wrr.12303/full. Accessed March 13, 2018. 13. Hanna MK, Nahai F. Vertical reduction and mastopexy: problems and solutions. In: Hamdi M, ed. Vertical Scar Mammoplasty. Berlin, Germany: Springer; 2017:293–300. Available at: https://link.springer.com/chapter/10.1007/978-3-662-55451-7_20#citeas. Accessed March 13, 2018. 14. Scalise A, Calamita R, Tartaglione C, et al. Improving wound healing and preventing surgical site complications of closed surgical incisions: a possible role of incisional negative pressure wound therapy. A systematic review of the literature. Int Wound J. 2016;13(6):1260–81. doi: 10.1111/iwj.12492. Available at: https://www.ncbi.nlm.nih.gov/pubmed/26424609. Accessed March 13, 2018. 15. Abe Y, Kashiwagi K, Ishida S, Mineda K, Yamashita Y, Hashimoto I. Risk factors for delayed healing at the free anterolateral thigh flap donor site. Arch Plast Surg. 2018;45(1):51-57.